The Nikon AF-S 50mm f/1.8G is an inexpensive lens that is compatible with both full frame (FX) and APS-C (DX) Nikon digital SLR cameras. For many photographers this is a “must have” lens when starting to explore the creative aspects of photography due to it’s f/1.8 max aperture. This allows for great results in low light, or when you want to blur the background. This lens is also a great starting lens for portraiture on APS-C (DX) bodies thanks to the crop factor. This makes the lens behave more like a 75mm focal length on a full frame body. By using longer focal lengths, the photographer must step back which helps to eliminate prospective distortion. I personally prefer to use lenses around 85-135mm for head shots. Not only does this help with perspective, but makes your subject a little less uncomfortable thanks to the longer working distance. No one like to have a camera shoved right up in their face. Image quality is excellent, which should come as no surprise. 50mm lenses are rather simple designs that have been around for as long as 35mm SLR cameras. On full frame bodies the 50mm is a near “normal” field of view, and on APS-C bodies is a short telephoto. Wide open on full frame bodies this lens does exhibit some vignetting, but it is easily fixed if you shoot raw in post. If you are a JPG shooter, most modern Nikon bodies will automatically correct this. On APS-c bodies the vignetting is minimal thanks to the crop factor that brings the edges of the frame in from the edges of the lens. This is the so called “sweet spot” of lens design. Stopped down to around f/4 the vignetting is minimal on full frame bodies. Again, 50mm lenses are pretty simple to design and as a result distortion is usually not a factor in this lens class. The Nikon AF-S 50mm f/1.8G is no exception, there is not any noticeable barrel or pincushion distortion. Wide open the lens does exhibit some chromatic aberration, especially near the edges full frame bodies. However, this is also easily fixed in post processing when shooting in raw. On APS-c bodies the CA is not as pronounced. For JPG shooters, again this is typically auto corrected by the camera. Unless the sun or other bright light sources is directly in the frame, there isn’t much in the way of lens flare. This lens features a depleted recessed front element that helps with this, but the lens also includes a lens hood that can be used to help when the sun is directly outside the frame. If the suns or other bright light is directly in th frame you will see some lens flare but it is not bad at all. This is due in part to the simple design with few glass elements in the lens. Build quality is decent. The lens is made of plastic and features a metal lens mount. There is a rubber gasket that seals out dust where the lens and the camera body meet, but this is not a weather sealed lens. This is another lens that I highly recommend to pretty much all Nikon DSLR owners. For full frame bodies this is a “normal” lens giving a very similar perspective to what we see with our eyes. 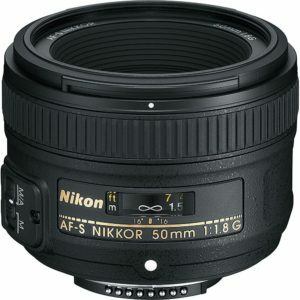 For APS-C bodies, the Nikon AF-S 50mm f/1.8G is a great lens to get started in portraiture. For full frame owners this lens is a “must have” in my opinion. But for APS-C owners I typically recommend the Nikon AF-S 35mm f/1.8 DX lens unless you are looking to get into portraiture. The 35mm DX lens gives a more “normal” perspective like the 50mm lens does on full frame bodies. Overall this lens is Highly Recommended! based on 3507 user reviews online.